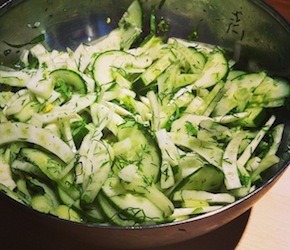 Cucumber, peeled or un-peeled and cut into bite size chunks? Handful of fresh herbs chopped (basil, thyme, oregano, chives etc) OR use the dried herbs you’ve got on hand? Squeeze of lemon/lime or splash of vinegar (white, sherry, red wine)? Sea salt + freshly ground black pepper (optional)?